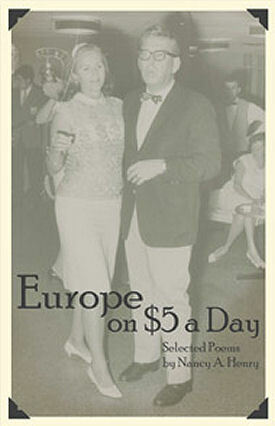 For those of you who have had the pleasure of hearing Nancy Henry read her poems, you will be delighted by her latest chapbook: Europe on $5 a Day.....Poem after poem in this book is filled with language and images that keep you on the edge of your seat--either from laughter or titillation. Though, what gives this collection its real life is Henry's intelligence, which imbues each poem with poignancy, openness, and a genuine compassion for the world and the people around her. Erosion, Nancy A. Henry's latest chapbook by Moon Pie Press, is reminiscent of times past, before television and computers, a time when lovers might have spent nights rollicking through moonlit gardens or indulging in the heady pleasures of the boudoir. On the bookcover, the word Erosion is divided into the words Eros and Ion. Ions are charged subatomic particles, unstable atoms that are either delirious with having too much of what they need, or even worse, not enough. An ion can only be at rest once it bonds with another. It's an apt play on words. The title seems to be hinting that our yearning for physical and spiritual connection is foretold by our very atoms. Walt Whitman, a kindred spirit, wrote, "I am he that aches with amorous love; Does the earth gravitate? does not all matter, aching, attract all matter? So the body of me to all I meet or know." These poems are imbued with a sensual honesty, inviting the reader to "be my Chagall lover / float with me above a small chaotic town / our silks and fingers tangled up together / in a storm of crabapple blossoms." Intimacy is evident in a breath, a whisper, the smell of a lover's pillow. This is the altar of the body, mind, and spirit; the small worlds that swell and crumble with a kiss. nothng is receiving this insult with grace. just please God, nothing that will stay. two blocks of ruby ice.